Share the post "The New Mobile Computing"
My train commute to and from San Francisco last week gave me the opportunity to test out my newest mobile writing solution. It’s something I’ve been interested in doing since the iPad was first announced, but my initial attempt several years ago was a bit awkward. I’ve always been partial to very lean writing machines — ones that will allow me to just get up and go, and have at my fingertips everything related to my current writing project. My first three laptops were the diminutive PowerBook 100, PowerBook Duo 250, and PowerBook 2400c. The problem with all three of these machines was that they were adequate only as supplemental devices with a very specific (and limited) purpose. None was ever my primary computer. I always had a faster desktop system with a superior display as my main sit-down-and-pound-it-out novel writing machine. It wasn’t until the aluminum PowerBook G4 models that there was a laptop robust enough to also serve as my primary computer. I bought a 15″ PowerBook G4 in late 2003, permanently retired my last desktop, and then upgraded to a 17″ model a few years later, then to a 17″ MacBook Pro in 2009. Both 17″ laptops were great machines, with screens so big and sharp, I could see two full pages side-by-side while writing. Nerdvana! They were also bears to lug around, a bit ridiculous on a train, and nearly unusable on an airplane. I didn’t mind stepping back down to a new 15″ MacBook Pro in 2012. Somewhere in there, the MacBook Air was released. I was fascinated by this nearly perfect portable writing machine, but I couldn’t rationalize the price for something that would be as comparatively limited as my first three PowerBooks were. Then came the iPad. Huge potential in a tiny package, but unproven, heavy, and still a bit limited. 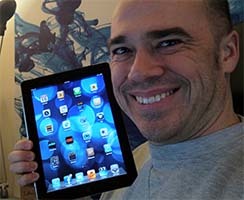 I decided to let others suffer the early adopter pains, and started with an iPad 2 in late 2011. While I can’t pin any shortcomings on iOS 5, everything else fell short in some critical area. The iPad 2 had a fairly low screen resolution that led to a bit of eye fatigue; Pages 1.x was weird in some ways and hideously ugly in others, with a color palette and visual design that always made me want to look away; the Logitech Keyboard felt flimsy, had an odd selection of shortcut keys, and was inconsistent with Mac conventions that had become engrained in me over 24 years of writing on proper Macs. In short, it all felt a bit clunky, and I didn’t get much writing done on it. I reverted to writing on my 15″ MacBook Pro and used the iPad for other things for which it was better suited, like playing games and watching videos. Then came the iPad Air. It was initially appealing to me because, in addition to having a much better screen than the iPad 2, it was a full third lighter, dropping from about 1.5 lbs. to 1.0 lb. That seemed to make it well suited for reading e-books — something that the weight of earlier models made unappealing to me. Half a pound isn’t much, except when it’s a lot. The difference is amazing. 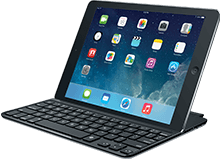 The screen is gorgeous to look at, Pages 2.x for iPad has a clean, polished UI, and the new Logitech keyboard feels much more solid, supports every Mac keyboard convention I’ve thrown at it, and does away with some of its own attempted conventions that I found contradictory and clunky. By the time my homeward train commute ended, I realized I had not only written a lot of material, I had enjoyed it. It’s such a great mobile writing solution that I think it may actually be my preferred one now — or at least an equal contender. The two weak spots are that the Logitech keyboard is a bit smaller than standard size, and the setup, being smaller than even a MacBook Air and held together by gravity and magnets, is a bit less stable on a bumpy train ride. On a plane, I think it will be perfect. There’s also something very focusing about having one’s writing isolated to a moderately small window, with no other apps in view. Writing on a 22″ display has its own virtues, but in the twelve years since I last worked on a sub-compact laptop, I forgot the beautiful utility of small. Which brings me to my final thought. There’s been a question in technology circles for almost four years now: Does a modern tablet device, like an iPad, count as a computer? The needle has generally been swinging from No to Maybe to Yes, with caveats. For me the answer is now a resounding YES. My experience with my new setup utterly buries the needle. The User Interface is designed around a single-screen, single-app paradigm. You get one display, one app on the screen at a time, and that’s it (though other apps can keep running in the background). The User Interface is designed around a full-screen experience. You have full-screen as an option on a “regular” computer, but here it’s the only way. If numbers 2 and 3 sound familiar, that may be because they’re basically where the graphical user interface started 30 years ago. As for number 3, it turns out it’s not nearly as limiting as I thought it would be. I actually appreciate the simplicity in this usage context. The iPad (and other such tablets) represent a new class of computer, but they are absolutely computers. 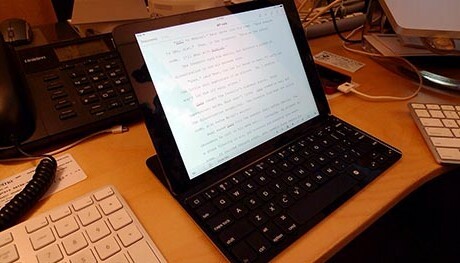 And for mobile writing, they’re practically perfect.